The most convincing demonstration of transcriptional activity in a particular chromosome region can be obtained in autoradiographical experiments. Using 3H-uridine as a precursor of RNA synthesis, it was shown that puffing regions are the most transcriptionally active sites on polytene chromosomes (for a review, see ref. 12). As for interbands, the light microscope has insufficient resolving power to decide between activity and inactivity. 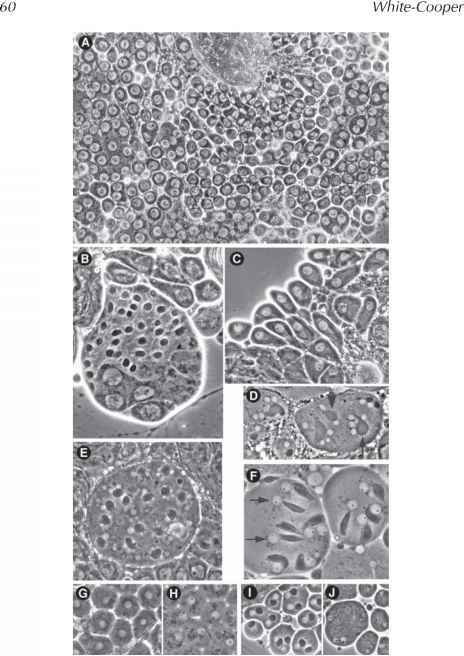 However, this question can be addressed by EM autoradiography (Subheading 3.2.). 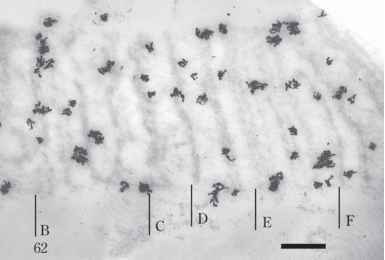 We applied the thin-section squash technique to precisely localize where 3H-uridine had incorporated into chromosome structures (13). The results showed a good correspondence between LM and EM data: Maximum incorporation was observed over the puffing regions and minimum incorporation was found over the dense bands. Silver grains occurred also over the interbands and diffuse thin bands. An example of such labeling is shown in Fig. 3. To get a reliable result, this investigation was performed on serial sections of a large number of chromosomes. Fig. 3. Electron microscope autoradiography of the 62B-F region of the D. melanogaster 3L chromosome. Scale bar: 1 pm.